Oh it's September already?! Whoa Nelly. The kids and I have had 12 whole weeks of summer fun, and I think we're all ready for school to resume! The other day, we took Henry to his kinder orientation at his new school, and he is beside himself with excitement. And we are equally excited to know that he has the teacher we requested (Alison's old teacher!). Alison is eager for 2nd grade, and Kate is growing up way too fast. Every day she has a new word or saying, and she's definitely going through her language "explosion!" For sure. Oh, and we bought her a big girl bed (after several rounds of her climbing out and about). She's super proud to have her own bed, and if you're a mama or papa of a little one, you know that graduating to a big kid bed is exciting stuff. And I'm sure you also know that once the confines of a crib are gone, the trick is to get the child to actually stay in the bed. Well, Kate? She's the only one of our kidlets who has decided that staying in bed is A-OK. So a big WHEW on that one! Here's a peek at her pretending to sleep (what a ham). Summer has been hopping busy for the shop, and it's felt like Christmas around here. I've also been doing a lot of investigation, and hopefully soon I'll have some new goodies in store for you. And you, and you, and you! Let's see what else? Um, not much! Just enjoying the last bits of summer before heading back to the routines and rhythms of fall. Hope you enjoy your last days too. I just realized you had a blog and added it to my blog list. Sweet picture! I didn't know you had three kiddos! I hope you ALL have a wonderful school year! Big girl bed?! So exciting. We recently made the same big step too! What a beautiful pillow! And either your little one has great taste, or she didn't choose her bed :) My daughter chose her big girl bed - and it shows. what a cute big girl bed! congrats kate! Kate just keeps getting cuter & cuter every time I see her. It's been a busy August for me too! so so cute in her big girl bed :D love that giant pillow too... :) makes her look tiny! Look at that pillow! 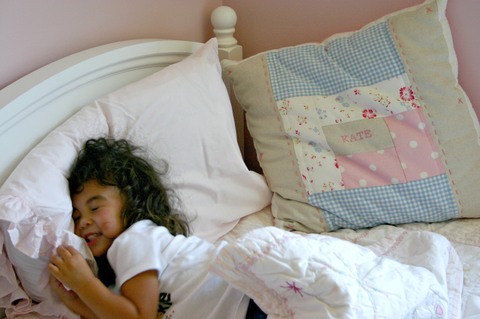 I can't believe how big Kate is and how clean that pillow still is LOL!! Oh my gosh, she is the cutest.... I can't belive how fast she's growing up! Hey girl...where ya been hiding? I love your Christmas cards! I wanted to let you know that I recently posted a recap of the Stitch indie craft bazaar in Austin, Texas. I am also hosting a swag bag giveaway. I'd love for you to enter & to pass the word on to your friends! just thinking of you, :) how are things? I LOVE The Paper Princess and find your designs brilliant! I will pass along your site to all my girlfriends. Darling bed... even cuter girl! Your daughter is so adorable! I love your blog!